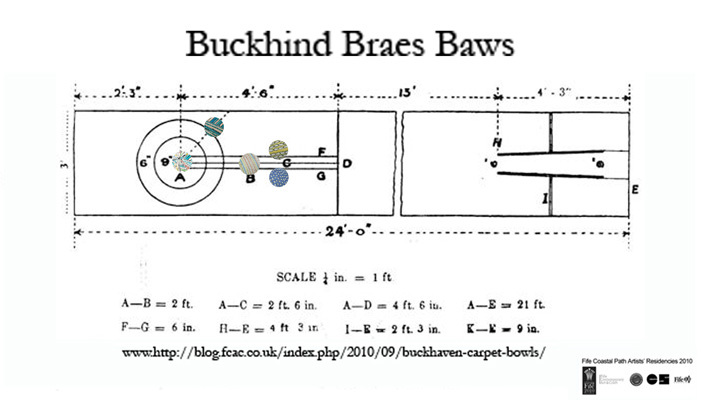 ﻿The Buckhind Braes Baws project is rolling along and we are fast approaching the completion of the design stage. Our multi talented group have embraced every aspect of the project so far, developing exciting and individual responses to the Fife Coastal Path at Buckhaven. Collectively these ideas will form curios, beautiful and intriguing pattern designs for our sets of carpet bowls. We are delighted to have swelled our numbers with new recruit Janette and we are now also working with local joiner and carpenter Alex Donnelly who has agreed to make boxes for our sets of bowls. The group have been meeting regularly at Buckhaven Community Centre working hard but also enjoying good lunches and regular tea and cake breaks. Photographs have been carefully looked through and organised onto the wall of our studio. A set of fast paced drawing activities triggered an abundance of exciting starting points for pattern designs. Keen fisherman Gareth has developed intricate illustrations of his daily trips to the sea- shore. Liz has filled her sketch book with an array of exciting possibilities from patterns inspired by the staring eyes and bright colours of the Wemyss Ware Cats to the distinctive weather beaten wood of the fishermen’s sheds with their heavily padlocked doors. Christine has also been thinking about our wander through the fishermen’s sheds, developing designs around the lobster pots and also a curios stone form that may have been a mooring point for boats at some point in the harbours history. Janette has focused on summer time at the Buckhind Braes creating a set of illustrations depicting picnics, sandcastles and jaunty looking seagulls. Marion has managed to pin down a long list of exciting possibilities to her interest in astronomy and will use the constellations as motifs for delicate repeat patterns. With design ideas nearing completion our plaster moulds were put into action with the group forming an efficient production line, weighing out lumps of clay, wedging and de-airing and carefully pressing out the lumps of clay into spheres. The first stage of a multi-layered process of drying, refining, firing, polishing, painting, and glazing that will take us to the finished work. We all meet again on the 28th October at Edinburgh Ceramic Studio where we will look at how to transfer our designs from the page onto the carpet bowls. In the mean time I have lots of glaze tests and firings to get ready. Fascinating! What a great and novel idea. I liked seeing the stages and individual sketches for this project. All the best! We’re having a brilliant time being involved with this project and Frances is amazing in her ability to deal expremely sensitively and encouragingly with such a diverse group of individuals! I’m not surprised you’re having such a good time – the designs for the bowls are wonderful and all so different. Can’t wait to see them finished! a really lovely idea, rekindling an old local practice with a contemporary twist. Love the research drawings too, especially Christine’s crab. May your bowls run true. door/padlock.Will be interesting to see which are used for the finished bowls.